GESU envelope Clutch Purse,A women's fashion handbag collection, which is elegant,gorgeous for evevning out,dressy occasion etc. GESU is specialized in Women clutch evening bag.More Professional,More Focus,We believes every woman deserve to be better in every occasion and even much better like wedding,banquet,party or any Special Social Activities,captures all the surrounding eyes,Make you more confident,we really love to see the best of you,Because More Satisfying to our customer is the important persuit of GESU,afforadable price, Definitely worth to buy. Material: Sparkly synthetic material,Fabric lining. Size:9.1 * 1.6 * 4.7 inch,detachable strap is 46.49inch. Use Style: Evening Handbag/Shoulder Bag/Clutch Purse. Your highly quality of shopping experience is what we are purchasing for.As an honest Amazon seller,we offer convenient and efficient after-sales service;If you receive goods which is not in good condition or any defects,Pls feel free to contact us if there is any problem.We will follow up within 24 hours and try our best to solve your problem,which is highly appreciated and welcome and we also welcome you to share your comments. 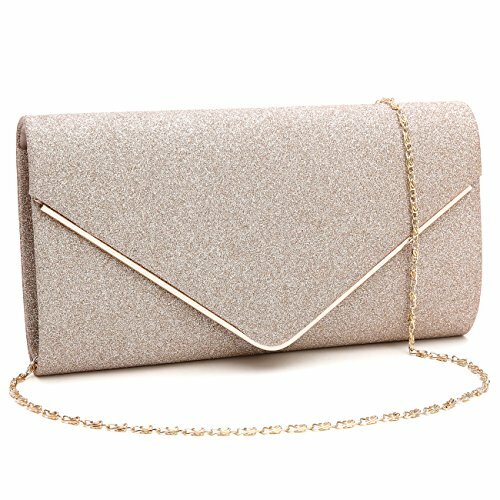 VERSATILE DESIGN: glitter clutch purse easy to match your shoes, Princess style dress,or nail polish as well for wedding or prom,make you classy or elegant. PERFECT GIFT:Great for your bridemaids,your lover or family members as gift in special day,such as Wedding,Birthday,Valentines Day,Mother's Day,Christmas Day. FLAWLESS INTERIOR: Not too small or too big, Pretty cute but spacious inside, Enough space for your essentials,such as smartphone iphone 8 Plus,lipstick, tissues,keys,small mirror makeup and credit card. FLEXIBLE CARRY:You can hold this clutch purse IN YOUR HAND or you can also use it as a SHOULDER BAG or CROSS BODY BAG with the chains coming with the bag (detachable strap is 46.49 inch ). MULTI OCCASIONS:As evevning bag is perfect for parties, weddings, date nights, or family reunion, prom, banquet and cocktail party when you take part in special occasion. as a daily clutch,Stylish, leisurely when you're out of the street and have a vocation. If you have any questions about this product by GESU, contact us by completing and submitting the form below. If you are looking for a specif part number, please include it with your message.